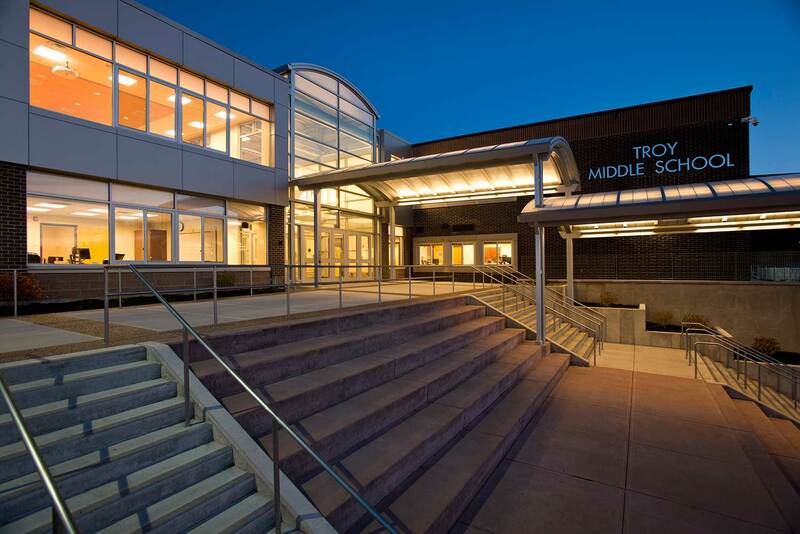 In 2010, the Middle School in Troy, New York, was symptomatic of the struggling upstate New York post-industrial city it served. Built in the 1970s, the building had poor lighting, layout, air quality and technology. Students who could, fled the underperforming school to private and charter schools. Those who could not, lived with what the state education department called low morale and low expectations. Brian Dunn became Middle School principal just before voters approved a $51.42 million bond issue in 2010 to gut the school and rebuild it. The mandate was to make the school a catalyst for improving student outcomes and fostering a stronger sense of community. The district needed to communicate in bricks and mortar the importance that Troy, as a city, places on its young people, their educations, safety and futures. “This is a narrative of transformation of a school that was at the bottom 10 percent of performers statewide, lumped in with the troubled schools of larger urban areas,” Dunn said. “The school was dark, cavernous, anonymous, dysfunctional, not well-regarded, not trusted. One of the keys to the “miracle” was the “interpersonal chemistry” that developed among Mosaic Associates, the Middle School faculty and staff, the district leadership and the residents of the City of Troy during the collaborative school design process. “It was really a very collaborative, fun, spirited redesign of the building,” Dunn said. From the rubble of what Dunn describes as “gaudy orange and key-lime green catacombs” the middle school emerged as a source of pride and a community resource, climbing up from the second-lowest rung of the New York State’s accountability rankings with an academic program that continues to thrive and grow. 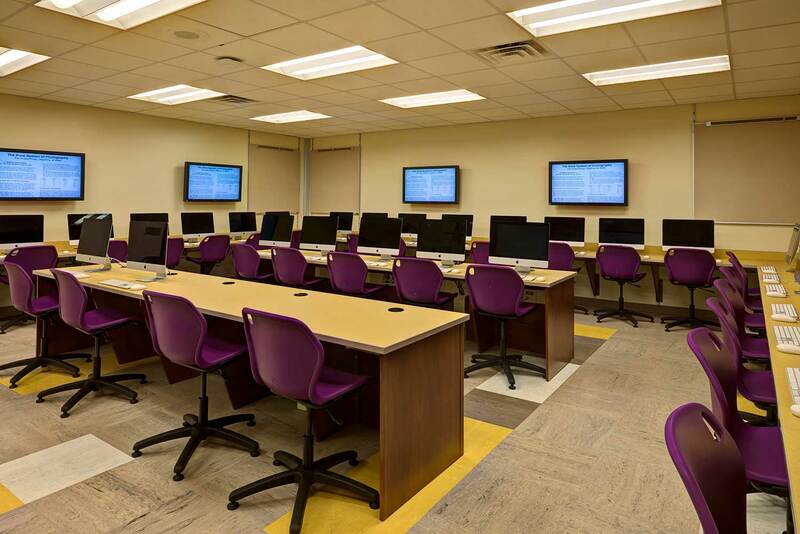 With university-caliber technology and an inspiring physical presence, it not only serves its 850 students, but hosts the district’s high-profile community events and professional development training. “I walked away from this project a believer in the power of architecture and how it can put substance to a community’s vision to change things,” Dunn said. 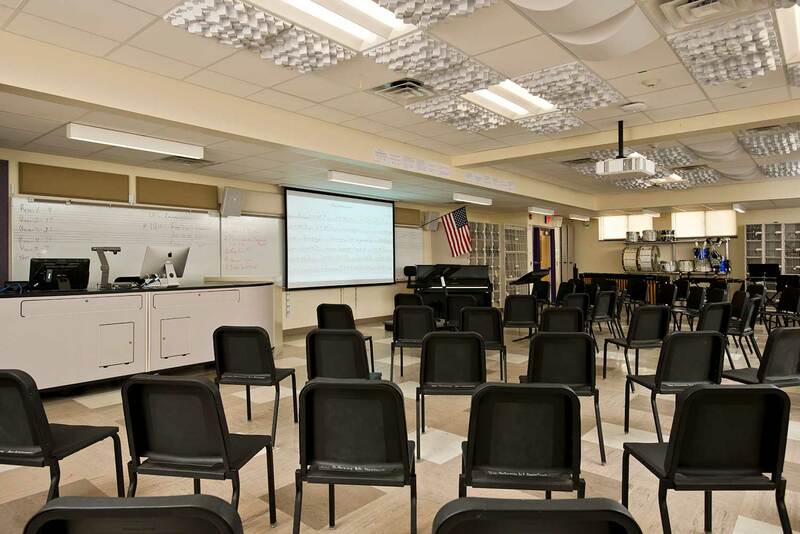 The project, completed in 2013, gave Mosaic the opportunity to collaborate with Educational Facilities Planners Shawn Hamlin and Robert Hendricks and the community’s important stakeholders to transform the role of the middle school in the community while respecting existing resources and building aid calculations. The heart of the design begins where the facility’s users do: the front door. Sunlight pours through skylights and windows into the entryway atrium, which serves as a welcoming gateway to the community and an informal gathering place for students, staff and visitors to get their bearings. 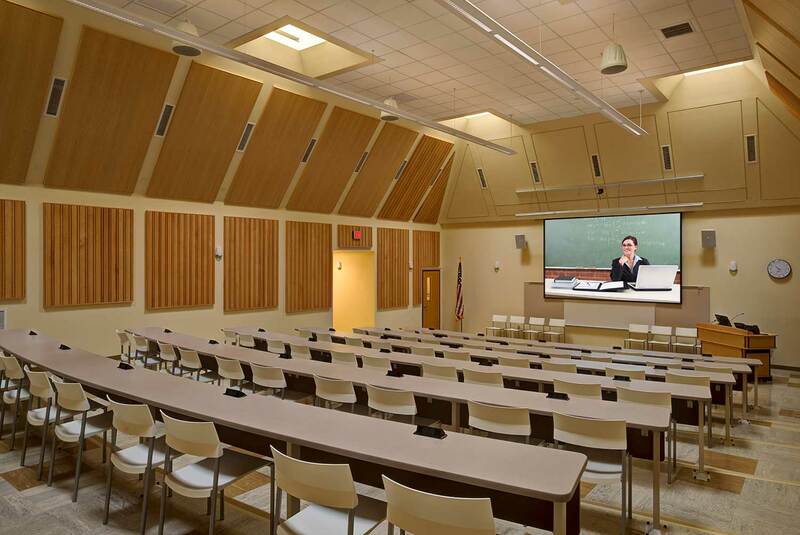 The adjacent “Troy Room” provides a more formal gathering space for student and community events. The interior of the 198,000 square foot building was demolished, asbestos removed and the foundation shored with 150 micro-piles. 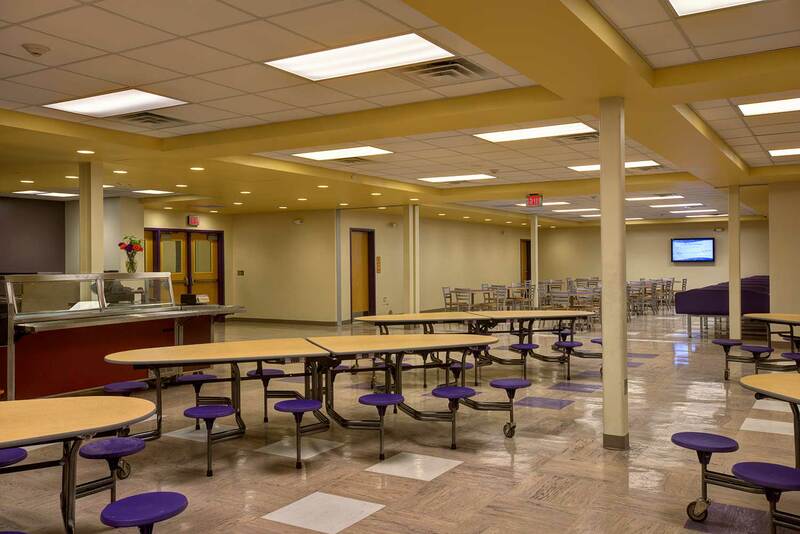 New roofing and skylights were installed and elevator and wheelchair lifts were added, along with administrative offices and renovations to the pool, gymnasium and cafeteria. 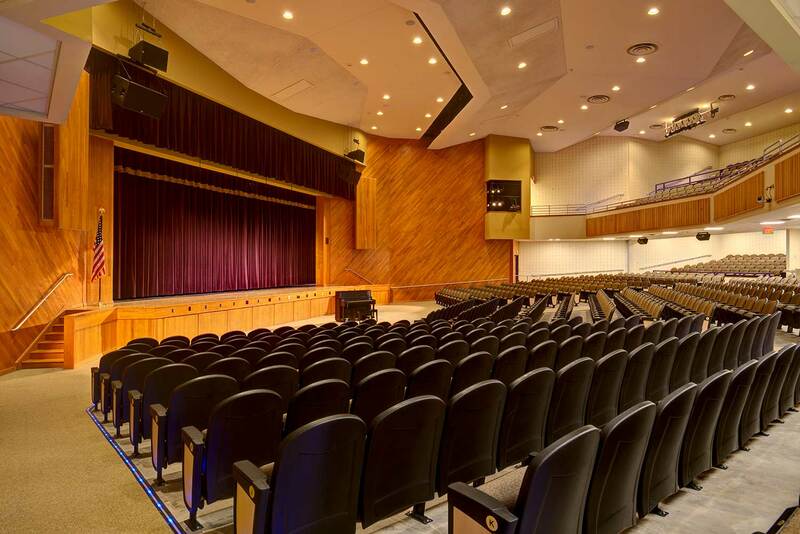 The construction of the music wing and auditorium included an extensive theatrical, lighting and audio-visual installation. 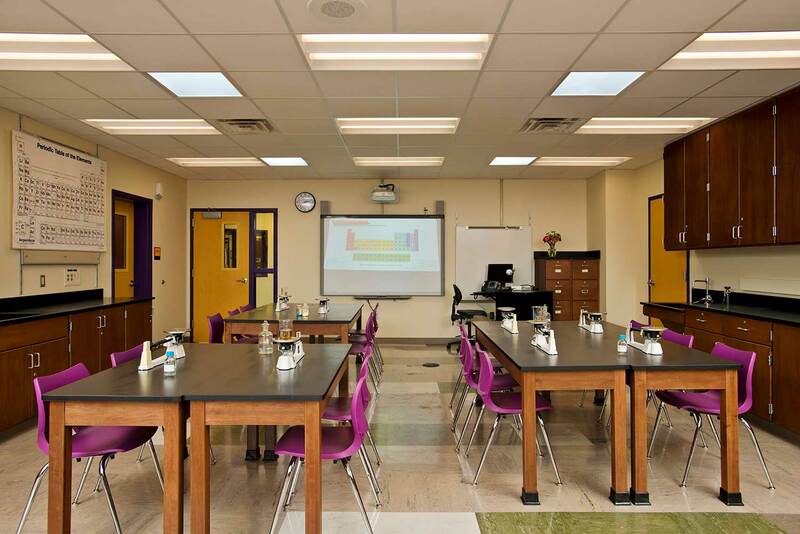 The 67 classrooms and instructional spaces are grouped in three “small learning communities” – schools within the school – to allow a team-based focus on the diverse needs of individual students. 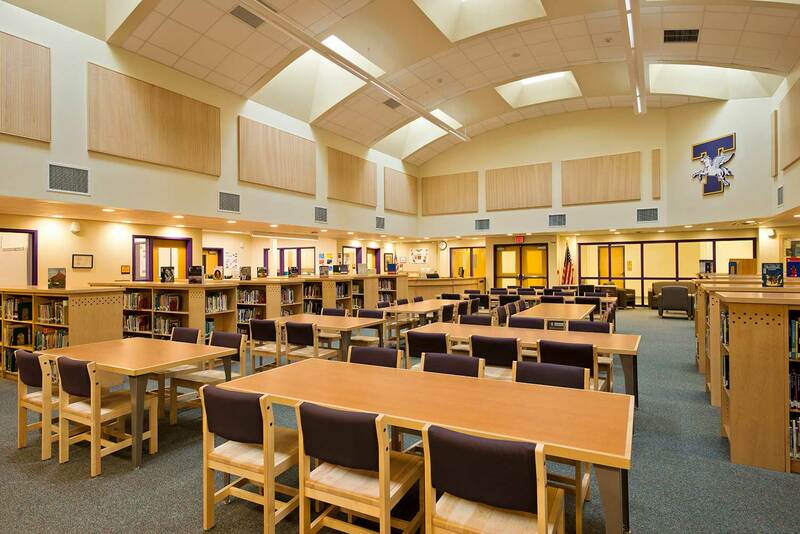 Each neighborhood, positioned strategically along primary circulation routes, includes classrooms, labs and offices for administrators, guidance counselors, and teams of teachers. 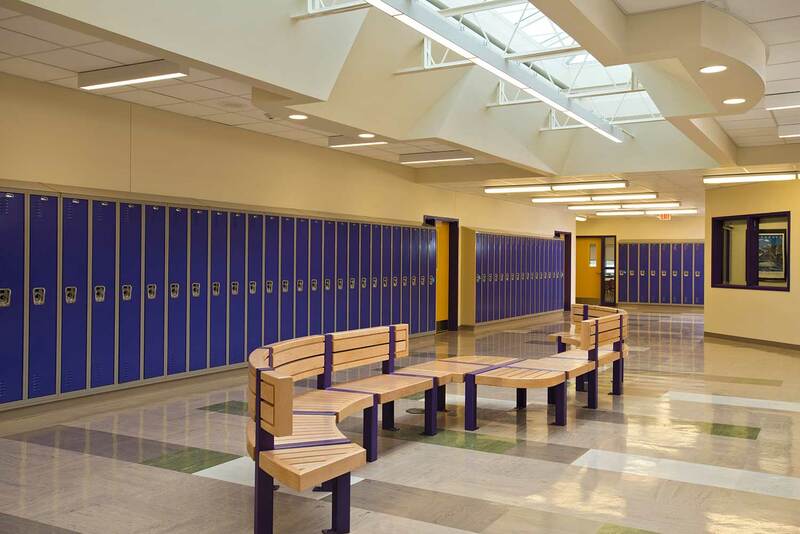 Well-designed sightlines help staff more effectively supervise the students in the hallways. The other 2 percent? 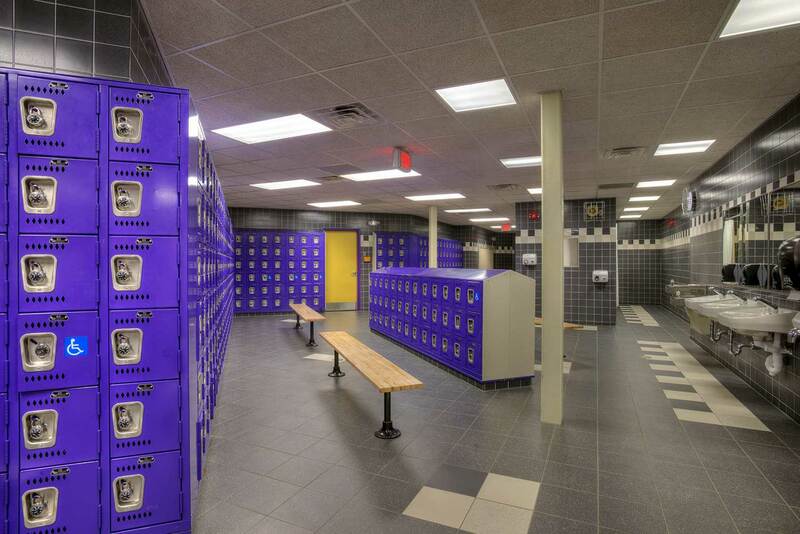 In the grand scheme of prioritizing expenditures on the remodel, the district opted for painted walls in the hallways. The Troy district is currently working with Mosaic on a $22 million district-wide infrastructure project.